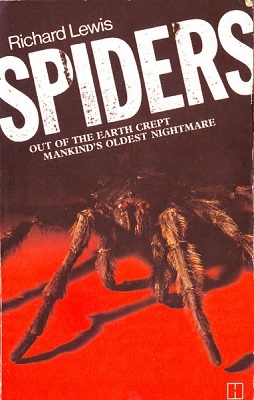 Spiders is a 1970s horror novel written by Richard Lewis and the story begins by introducing 67-year-old Dan Mason. He may be getting on in years but Dan is fit for his age and looking forward to his retirement. He and his wife plan to spend their golden years in the country and have just bought an old farmhouse. The house needs a little work doing on it here and there, but Dan is not afraid of hard work and makes a start on the garden. It’s while he’s busy weeding that he first spots a rather unusual-looking spider. It’s rather a nasty spider too and it bites Dan on the arm. Of course, Dan is not too impressed by this turn of events and gives the offending arachnid a fatal taste of his boot. After the encounter with the spider, Dan decides to call it a day, takes a shower, and then goes to bed. When he was in the garden Dan failed to notice that the spider had a lot of eight-legged mates with it. The spiders didn’t fail to notice Dan, though. When Dan wakes up it is still dark and he can hear a sliding, scraping whispering noise. Then when he reaches out and switches on the lamp beside his bed he discovers that his arm has swollen up to about three times its normal size. The lamp reveals something else as well. The bedroom carpet is covered with an undulating black mass of spiders that are making their way towards his bed. One of the spiders is a lot bigger than the rest. It’s about the size of a large crab and is sitting on the window ledge, watching Dan. At its signal the other spiders attack. The spiders don’t leave much of the old man, just some bones and a few scraps of flesh. When the police find the remains they are mystified and it’s a difficult situation for Inspector Bradshaw to explain to Dan’s son, Alan. “Eaten,” he shouts. “What the hell do you mean eaten?” Alan is a biologist and when he goes down to Dragon’s Farm he sees with his own eyes exactly what the policeman meant by ‘eaten’ and, although he is shocked by what he finds, his keen eyes do not fail to notice a spider’s leg hanging from the windowsill. He has never seen anything like it and knows that the leg has not come from any known breed of British spider. When another death occurs in the village, Alan accompanies Inspector Bradshaw, to the crime scene and finds another spider’s leg near one of the bodies and it is not very long before he has a whole spider to examine under his microscope. By then the problem has escalated and the spiders are heading towards London. Alan Mason is the main character in Spiders and, police inspector, Neil Bradshaw plays a pretty mean second fiddle to him. I liked both characters and they were reasonably believable, but one thing got on my nerves. Alan Mason is supposed to be a biologist and yet throughout the book he repeatedly refers to the spiders as being insects. So does everyone else in the book. Spiders are not insects, they are arachnids. I think most people would realize this—especially a biologist—and every time the word ‘insects’ was mentioned it not made it a little harder to believe in the story. That’s a pity because apart from that I quite enjoyed the book. Spiders is 153 pages long and will probably send a chill down the spine of any reader that is afraid of spiders. I am not particularly scared of them (I own two rather large tarantulas), but I still found the idea of an army of flesh-eating spiders rather unnerving and I think any reader who is scared of spiders could find this book so terrifying that they might feel compelled to seal the bedroom windows with tape, block the air vents and sleep with the lights on. So, if you suffer from arachnophobia and choose this book as your bedtime reading, don’t say I didn’t warn you.